Our Stainless Steel S-Hooks are made from Grade 304 stainless steel for corrosion resistance. 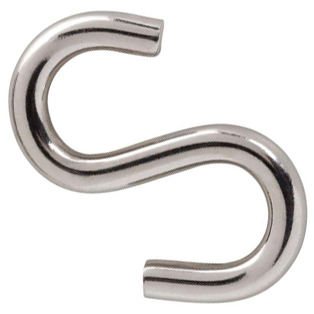 These "S" Hooks are used for non-critical marine and industrial applications. Our S Hooks are made from Stainless Steel, which allows them to be used in greenhouses as well as other moist areas where an S-Hook is needed. There are a wide variety of usages for an "S" Hook. They are not load rated and should never be used for overhead lifting or human support.